I sincerely hope this car's driver doesn't step in my lunch, which I was involuntarily compelled to deposit on the curb. 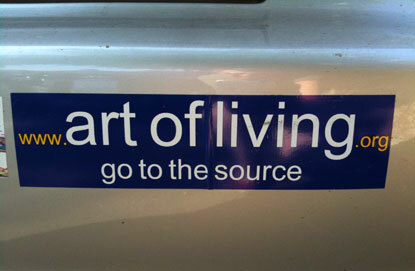 Art of Living? I loved their neo-avant garde electronica and their groundbreaking use of sampling technology back in the 80s. Close (to the edit) and Peter Gunn were awesome tracks, Trevor Horn is a genius producer. Oh wait, that was Art of Noise. Art of Living is that crappy guru. You said it Jody ! Indian avatards including this faux messiah has contributed to decline of United States of America. Only plucky American bloggers have the conviction & courage to expose them. It took a lot of time & effort to expose fradulent Nithyananda. I hope this SSSSSRavishankar with his sickening smile & voice also gets dethroned. And all his property & looted wealth in America gets confiscated. Indians are never going to do it. This Ravishankar worked behind the scenes in engineering Obama's victory in last elections. Like Arab countries America should also strictly enforce that avatards & their followers have no place in America. One Jody alone would suffice in enlightening all those seeking Enlightenment among Westerners. And you have such able supporters like Chuck , Stuart , Allen , Betty , Ellen , Yunus and I am sure many more free thinking Americans. --This is exactly how all cult nuts talk about their 'movements'. Go to ammachi.org or SSSr.org, same story ! You purposely missed the import of my comment. Jody , Yunus & Chuck having seen cults & their wily ways plus being aware of Yoga Vasishtam & Ashtavakra Samhita , Ramakrishna Paramahamsar would cure the seeker of this basic want of getting "enlightenment". The way the crying tenth man was made to realize he was the missing or rather the non missing tenth man. Reposting my comments from another blog exposing art of living cult. Many flock to such cult gurus claiming they had their diseases cured or got " healed ". So what?? A completely healthy body is also subject to death & decay. I have had certain ailments cured by my doctor. That did not make me frame his photo followed by worshipping.
" While travelling I saw a public performance by a magician...who was materialising a lot of things for the crowd.....was stunned & amazed how he could accomplish such feats. When the show was over , the magician went about asking for donations from each of us extending a rusty container. I asked him " you have the ability to produce whatever you want at the mere wave of a hand including food..so why beg for money from us..why not fulfil your need with your magic ?" The magician told his sad story how he did penance to win the favour of a Spirit that could perform whatever he desired. His wish was granted but with a stiff condition he could never materialise anything for himself or his family. Ramaiah asked why he should agree to such terms wasting his life as a beggar when he could get no real benefit from his magic. He said the Spirit had made it clear to him that the karma of his penance being inexorable , he would reap its fruits; if he opted out he would get killed instantly by the Spirit.Hence was destined to beg for the rest of his life.
" The fate of all who run after miraculous powers/siddhis is the same as that of this poor man". So the good old counsel 'be careful of what you wish for' is never to be forgotten. Let us not forget all the asuras performed mighty tapas only to ask for such megalomaniacal powers. Long time back I was coerced by my friend to come & have a "darshan" of Mata Amritanandamayi. She had not become this popular then. Just a fledgeling organization. Thank God , I listened to my instincts & walked away. People were behaving incredibly crazy. Screaming " Mata would slip into superconscious state during midnight...go into Devi Bhav...only the chosen fortunate will be hugged by her...all wishes fulfilled...blahblah.."
That nobody found it odd & that there was a sickening stampede is puzzling for me even today. There is but ONE CONSCIOUSNESS. There is nothing called super/supra/ultra/uber consciousness. All their charities & donations business fail to awe me. She also charges hefty capitation fees for a seat in colleges run by her.All enjoy tax exempt status calling themselves non profit NGOs. There is another extremely popular soothsayer in Chennai who many consider Goddess Incarnate. Running schools & colleges. I was shocked when one of the colleges run by him told me " for a fee of a certain amount of lakhs , here & now we can give you a certificate that you are a qualified graduate. No need to attend college at all..."
Eloquent testimony of the credentials of these " holy people". Is it any wonder bridges , houses approved by "qualified engineers" collapse? People perish owing to spurious medicines ? Please do watch Sathyajit Ray's Bengali movie ( with English subtitles) 'Maha Purush'. The conman sells "enchanted chillies" offering his feet for the thronging crowd. So brilliantly Ray has exposed Indian faux gurus. It is hilarious through & through as even qualified people get conned by his "manifestations".